This bright and colorful salad is sure to become a fan favorite. 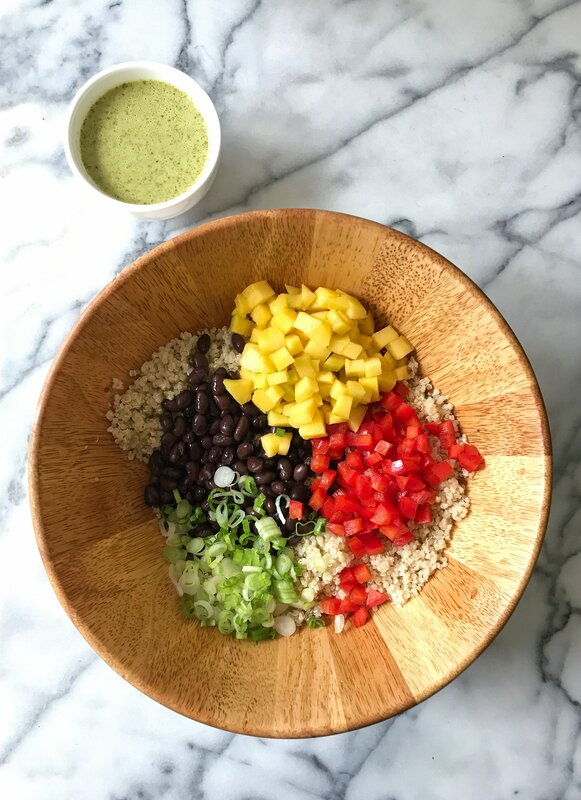 Made with only 5 main ingredients plus a Lime Dressing, it's super easy to make and so versatile, working equally well serving a crowd or as meal prep. 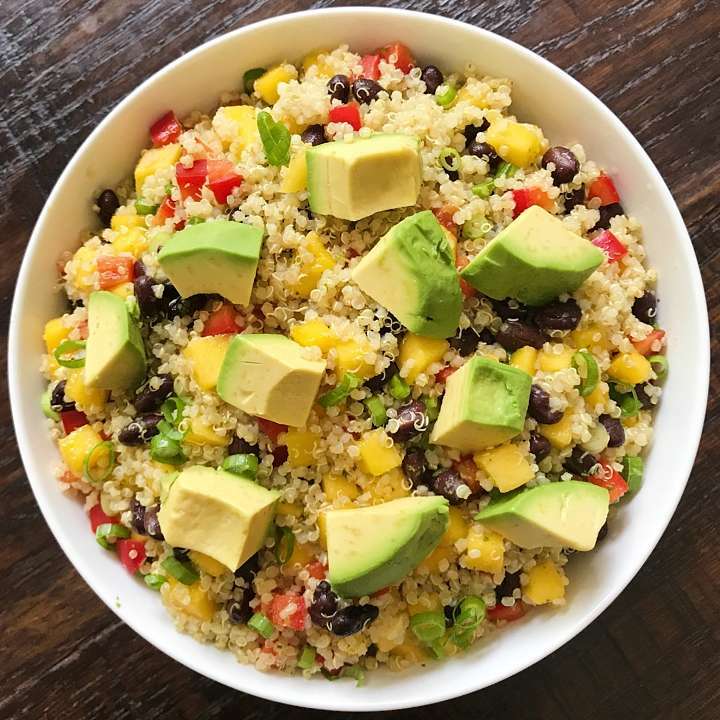 This bright and colorful quinoa salad is crazy easy to make and bursting with flavor in every bite! I first made it last Spring and it was on repeat all Summer long. This past week I made it for a friend and was reminded just how easy and delicious it is! It is so simple yet the best mix of flavor and textures. 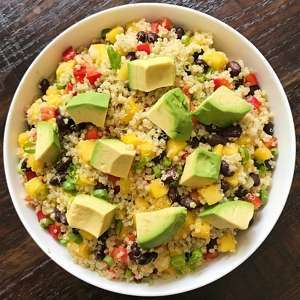 Juicy mango, hearty beans, nutty quinoa, crunchy pepper and scallions, all mixed in a simple Lime Dressing and topped with creamy avocado. You could skip the avocado but depending on what your eating this with, the avocado makes it heartier and is really yummy. And you literally only need 5 main ingredients: quinoa, black beans, mango, red pepper and scallions. 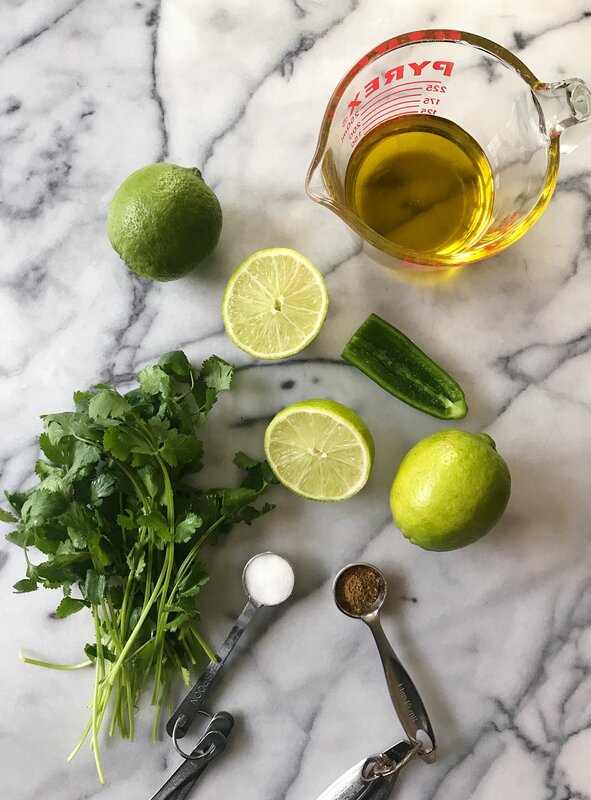 The lime dressing is made with just 6 ingredients blended together: Extra Virgin Olive Oil (EVOO), cilantro, fresh lime juice, jalapeno, cumin and salt. It all comes together quickly and this easy to prep salad has an amazing mix of flavors and textures. It’s fresh-tasting yet hearty, and perfect as is or alongside any protein of choice. Best part, it makes a large quantity and stays well for a few days (add avocado only when eating) so it’s great for meal prep or feeding a crowd –brunch, bbq, picnic, a pot luck. Scroll down for recipe and leave a comment if you try. .
A bright, fresh-tasting and hearty salad with a great mix of flavors and textures. Easy to prep, it's perfect on it's own or alongside any protein. Recipe heavily adapted from America's Test Kitchen. Place quinoa and water in a medium saucepan. Bring to a boil. Reduce to a simmer and cover and cook until water is absorbed and quinoa tender, approximately 15 minutes. Let cool, the fluff with a fork and transfer to a large bowl. If making salad immediately, spread quinoa onto a rimmed baking sheet and let cool for 20 minutes. Then transfer to a large bowl. In a small blender or food processor, process lime juice, jalapeño, cumin and salt until jalapeño finely chopped, approximately 15 seconds. Add oil and cilantro (while still running if using a food processor) and process until well combined, approximately 20 -30 seconds. 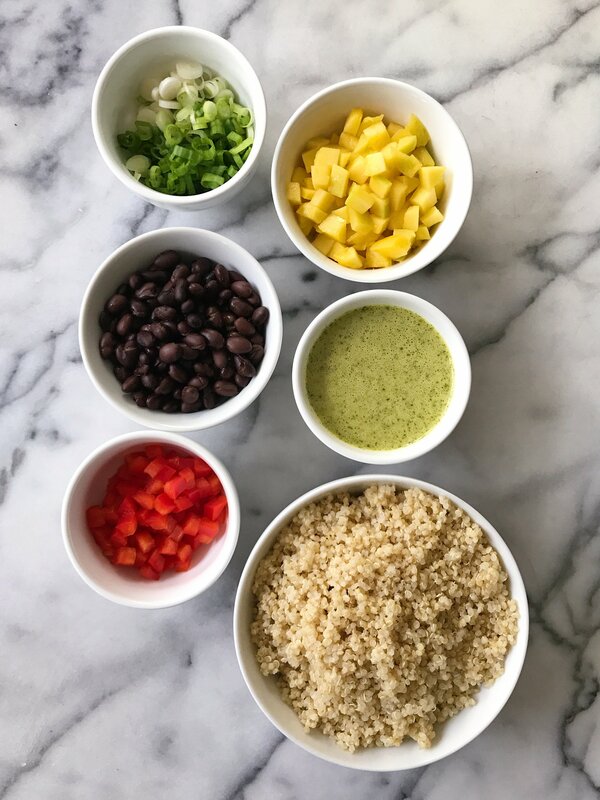 Add pepper, mango, beans and scallions to bowl with cooled quinoa. Add ½ the dressing and toss to combine. Taste and add more dressing as desired. Season with salt and pepper to taste. When serving, top with avocado. This recipe is so delicious. My kids gobbled it down and my husband who normally hates quinoa dishes had 3 helpings. We will definitely be making this again. Thanks Karen! So glad you love it too! Thanks for sharing! This was so delicious and easy! Thank you for sharing. Thanks Marci! So happy you loved it too!